So, I am working diligently to get everything done and organized before surgery, now just nine days away. Wow… I am both so excited and terrified at the same time! 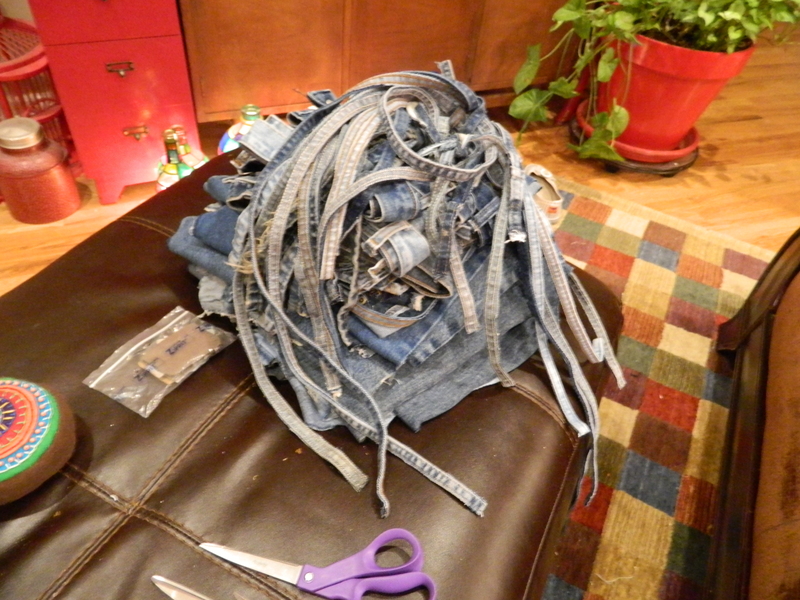 But work continues on the braided rug made of old jeans. After finishing cutting and harvesting denim from more than a hundred and fifty pairs of jeans… probably closer to two hundred. I’ve sold the back pockets on eBay for a nice little bit and I’ve sewed together all the inseams and bottom seams and have (mostly) fashioned them into bags and purses. I say mostly because I’ve still to find a tailor or perhaps shoe repair place that can do the final seams and attach handles as my somewhat specialty sewing machines just can’t do more than twelve layers of denim and/or leather (handles or straps). I am excited about finishing them though, they are going to be tré chic when they are complete. The three inch strips of denim are, for the most part, now combined to form reasonable lengths. It took some time and experimentation to figure it out, but I’ve landed on a length that I think will be most productive when I start braiding. I’m taking lots of photos and making tons of notes, I think I am going to do a in-depth tutorial on creating these rugs from start to finish, that is, starting at the very start to include collecting jeans and harvesting the fabric all the way through to the finished rug. So, I won’t put too much of that into these posts pre-tutorial. But I did do something that I thought I’d never do while in the process of turning the three inch strips into the finished strip for braiding. And that was to buy pre-wound bobbins. I don’t know why, exactly, I hesitated to do so, maybe something leftover from an early home-ec class or something about being thrifty and always winding your own bobbins. And heaven knows that I have enough bobbins and don’t really need to invest in more. But I found that with all the basic sewing that I’ve been doing, I have been just going through tons of bobbins and to sit and wind bobbins seems to be the most essential waste of time. Additionally, the pre-wound bobbins that I purchased seem to be wound very efficiently, that is to say, it seems to be twice as much thread on the bobbins than when I wind them, so I find that I am not changing bobbins as often. Which is awesome… again with the amount of basic sewing I am doing, nothing is as irritating just getting into a groove of sewing just to have the bobbin run out. And as my machine is overdue for maintenance, the bobbin sensor is getting in the habit of not alerting me and I find that I can run through feet of sewing before I realize that its not stitching! Argh! So, here is officially my stamp of approval on pre-wound bobbins. They’re not overtly expensive (I get mine off eBay), they save me both time and frustration and they are help saving my sanity! Can’t think of better reasons to use them! So, do you use pre-wound bobbins? I’d love to get the impressions of others who do a lot of sewing. Ever tried them? What’s your take? I’ve had some seriously disconnected days… can’t seem to get anything started or finished. Sold the last of the finished dressers and am down to only having my restored chandelier left for sale. Did manage to keep an eye on the free list on CraigsList and have a garage full of future projects. While I’ve been meandering, I have been “testing” myself on just how little I can go with fabric pieces by doing some piecing and should be ready to reveal my final decision in the next day or so. I mean, how small of a scrap piece would you save? You can check out my instructions on how to get the most out of a pair of blue jeans here. I also have the same instructions on instructables.com and can see it here. Other than the denim and the scrap piecing, I’ve been done a little goofing around with felt. 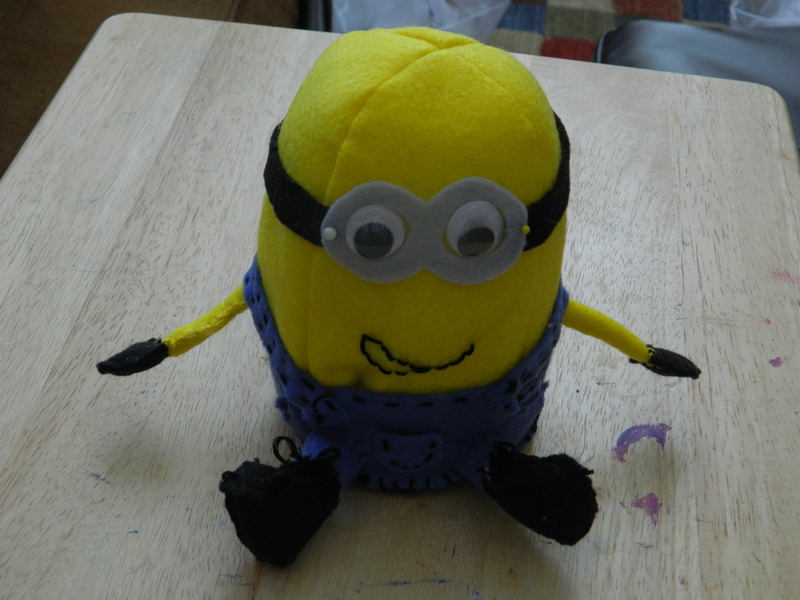 I found a pattern online for this cute little minion (it seems everything everywhere is about those little yellow guys), so I whipped one up. Some of the directions weren’t all that good and neither was the pattern… I am thinking about how I can make my own pattern for a slightly larger version of this guy. I know this photo doesn’t allow for size comparison, but he is about 6″ from top of his head to bottom. I’d like to make one maybe 50% larger… I even managed to find larger sized eyes. I want to do something different with his arms and legs, as I didn’t care for how they came out in this version. Even after modifying his boots to be more 3D-ish, I still don’t like it. I want to make his feet (boots) and hands (gloves) out of leather, which means it is going to have to be larger to work with. I have been trying to get our workplace in the garage into order. I picked up a deeper shelved piece and want to get things squared away before we get started on the next dozen or so projects. 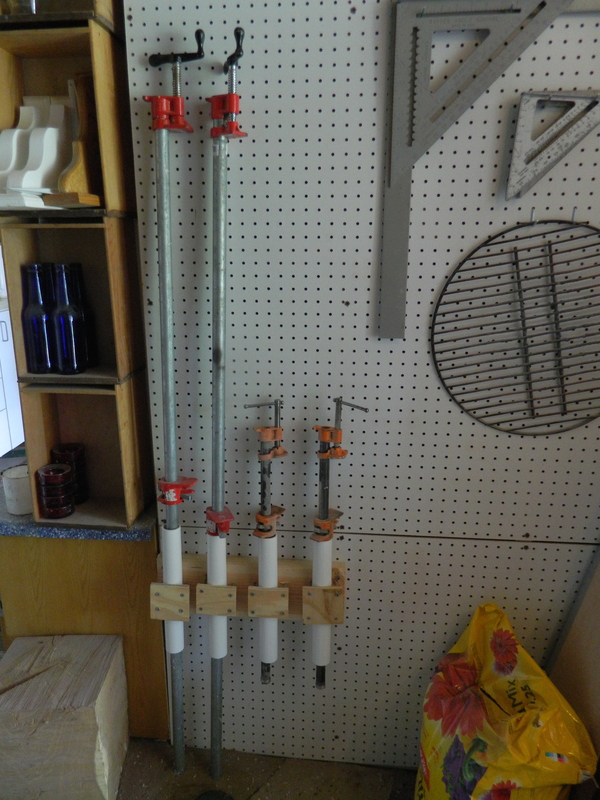 The Kid also managed to finally get a way to store our pipe clamps so that they won’t be constantly in the way or being knocked over. I am determined to get this garage into a more useable and convertible space. There is still plenty of space on this wall which is the back side of the work area. I also have an area that I want to be able to use for a paint booth and picked up heavy plastic sheeting a while back to use as “curtains” to contain the over-spray but nothing that is “permanent” so that I can still use the stall to park my car (sometimes in the Midwest, it is important to be able to garage your vehicles, like yesterday’s tornado warnings). Once situated – and it shouldn’t take long – we can get moving on the new pieces. You cannot imagine how long it has taken me to write these words! Geez, I hope soon to get my focus and motivation back!